Residents of the Chilean town of Pucon said they felt confused when the town's sirens went off on Sunday. The town is located near the Villarrica volcano, which erupted last month, prompting Pucon's temporary evacuation. Mayor Carlos Barra said he ordered firefighters to ring the sirens to alert people "to the continued threat". But many residents said they felt the mayor had "cried wolf". 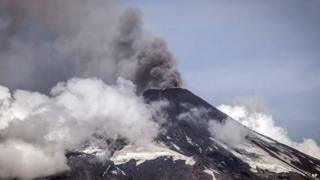 The state agency monitoring volcanic activity said the threat level had not changed. The agency, Onemi, said the seismic activity remained "moderate" and had not risen in the past days. Onemi's regional director also said his agency did not see any need for an evacuation at the present time. Ash could be seen rising from the volcano's crater on the weekend, so when the town's sirens rang on Sunday afternoon, many residents said they thought it was a signal to evacuate the town. On the town's Facebook page, officials said the measure had been purely preventative in view of Villarrica's "increased superficial activity" and were not meant to trigger an evacuation. But many posted comments criticising the mayor for "spreading fear" among the town's 22,000 residents. "Your protocol says that the sirens ring to evacuate people. How are we meant to know if it is preventative or real? You're confusing and alarming people for no reason," one woman wrote. "What a way to confuse people! The few tourists who are here started leaving, people were in panic. Horrible the way this was handled," wrote another. Many demanded there be clearer guidelines as to what the ringing of the sirens meant. Villarrica is one of South America's most active volcanoes and its most recent eruption on 3 March triggered the evacuation of thousand of people.